D’Appolonia site development projects frequently initiate with exploration/field reconnaissance programs. We develop a site exploration plan, subcontract drillers and monitor their activities in the field. Our expertise includes identification of difficult foundation conditions such as uncompacted fills, fills or natural deposits incorporating potentially expansive materials, karst (solutioned) formations, and potential subsidence due to undermining. Frequently, environmental considerations are a factor. Many site development projects have contaminants present in existing structures and also at and beneath the ground surface. We are experienced in performing environmental site assessments. We have in-house geophysical exploration capabilities that we employ to detect buried objects such as drums and tanks and to identify contaminant plumes. We are experienced in evaluating whether remediation can be achieved in a cost-effective manner or whether the site is unsuitable for use from an environmental perspective. We also perform wetland delineations, which may be an issue for sites with standing water or poor drainage and sites along streams or near lakes. Drill rig setting up at proposed development site. D’Appolonia performed a geotechnical exploration program in order to develop foundation recommendations for construction of the generating facilities. 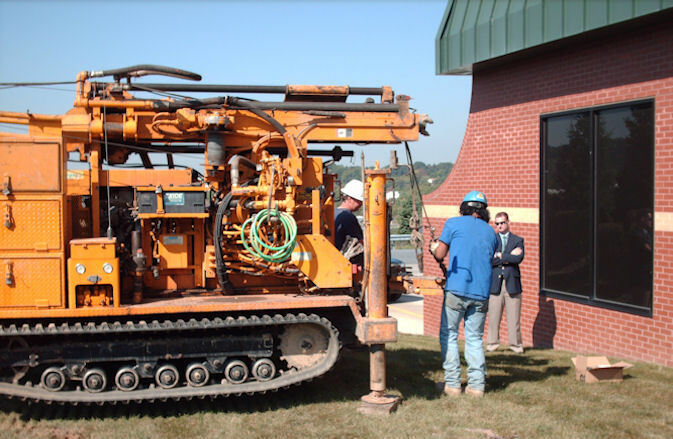 The exploration program included subsurface drilling for identification of soil and rock conditions. Soil resistivity tests were also performed in order to clarify subsurface stratigraphy. D'Appolonia provided site development consulting engineering services for a new car dealership. The services included: wetlands delineation, geotechnical exploration, foundation recomendations, pavement design, stormwater system design, site grading design, erosion and sedimentation control plan, and handling all permitting requirements. D’Appolonia provided consulting engineering services related to the development of a steeply wooded hillside in suburban Pittsburgh, Pennsylvania for a multi-story office building and parking garage complex. The feasibility of construction at the site was questionable because of concerns with the stability of the hillside, mixed foundation support requirements for the building, and potentially prohibitive site development costs related to the desire to maintain the aesthetics of the natural setting. For new construction at a brick manufacturing plant, D’Appolonia performed a site assessment study to evaluate the economic feasibility for alternative site locations, and included consideration of the costs of raw material transport. The scope of work included a structural evaluation of an existing railroad crossing above a concrete roadway tunnel and a parallel stream tunnel.